The canvas was created in 1874 in oil on canvas. 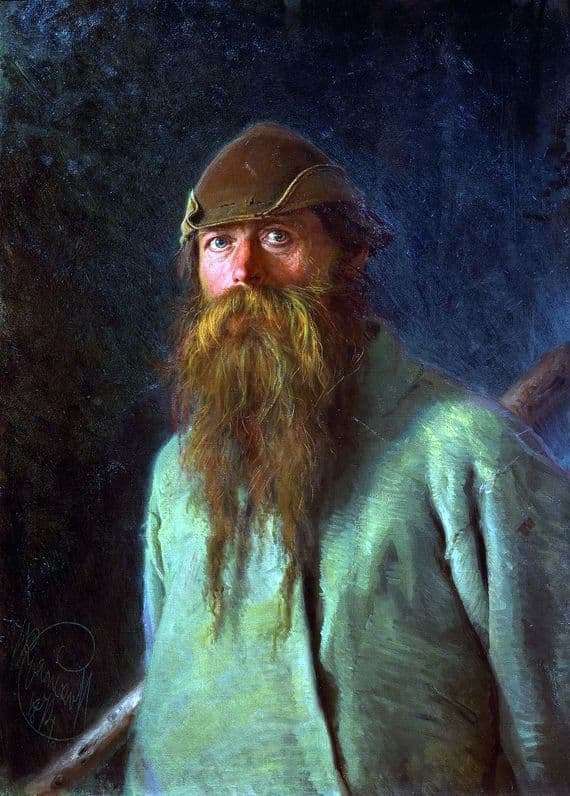 This is a very famous picture of Kramskoy. She entered the collection of paintings of the State Tretyakov Gallery. She was also called “Man with a club in the forest.” There was another name associated with the shot hat of the woodman. This type of painting was used in our country in the 1870s. The name “Polisovschik” is an old Russian concept, which meant a forester. Kramsky portrayed this one specially, at will. He wanted to show what kind of people live in our country. Though they are few, but, nevertheless, they are. He wrote about his picture to the Tretyakov, that out of such men there are uprisings of people like Pugachev or Stenka Razin. But in ordinary life, this type of people acts alone. On the canvas “The Woodcutter”, the forester man is depicted by an artist with a big club. His gaze is filled with anxiety. He carefully peers into the distance. Perhaps there the man saw the danger, but the forester was accustomed to such a way of life. He clearly knows how to resist any beast. His club is a weapon that he masterfully masters. He is like a lone wolf in the wilderness. This canvas caused and causes a lot of controversy and reasoning around the world. It seems to say that the power of the Russian indomitable. Russian people are not afraid of any difficulties. The dark background on the canvas additionally injects an already disturbing situation. The man is dressed in a simple shirt. His hat is shot, which indicates a great danger of his life, the difficulty you understand share. But the Forester will stand to the end. Life or death, whatever it takes. But even in his eyes you can read the insult, because he needs to confront not only a wild beast, but also those who want to kill them: poachers. A cap with bullet holes proves that a collision with them could take his life, but the forester survived. The canvas is stored in the State Tretyakov Gallery. Moscow. Pavel Tretyakov bought it from Kramskoy in 1875.